One day they´re greeting you at the door with their favourite toy hanging from their mouth, tail wagging and unconditional love shining from their eager eyes. The next day . . . they´re gone, leaving you with a hole in your heart, a chasm of grief that can seem insurmountable and overwhelming. While dealing with death is one of the tough realities of pet guardianship, it´s a topic that is often avoided because it can be uncomfortable to discuss. Cindy Soules, a BC SPCA board member and longtime SPCA volunteer, was devastated when her beloved cat Niki - one of the many shelter cats she has rescued over the years - passed away due to illness in June. 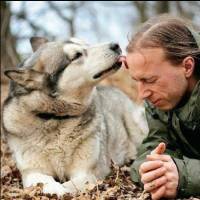 Niki had been a beloved companion for 15 years. “She was a gorgeous cat with so much personality. I missed her because she was so lively - she was always in every corner of the room,” Soules says. “I still miss her.” She feels it is important to grieve and to cry for the loss of any pet, and keeps Niki´s cremated ashes in an urn on her bookcase. She also has Niki´s paw prints in ceramic and photographs she likes to revisit from time to time. Chase, like Soules, feels it´s important to grieve. His personal blog - stuland.blogspot.ca - proved therapeutic in helping work through the loss of his great friend; he suggests people talk it out, or, if they have creative talent, write a song, draw a picture or do something to help memorialize their pet. He and his wife had to make the difficult decision to euthanize Nellie, who had been struggling with degenerative kidney failure for some time. Due to her illness she was experiencing excessive weight and hair loss, among many other symptoms. Both Soules and Chase note they´ll likely have more animals in the future - after an appropriate amount of time has passed. Because even though losing such a dear companion can be tough, the rewards that come before are “well worth it,” Chase says. *Take lots of photos. Fill an album, make a collage, fill a multi-picture frame and/or carry photos in your wallet. Have a favorite photo transferred to a T-shirt, mug, clock, button, etc. *Volunteer your time at a humane organization and/or help find homes for stray/unwanted pets.